Plenty of custom sneakers give the reader a good sense of what to expect from the design based on a nickname. In the case of this Air Jordan IV ‘Trinidad James’ makeup by DeJesus Customs, it’s not an established colorway we’re looking for, though it’s certainly reasonable to expect a gilded theme representing the ‘All Gold Everything’ emcee. 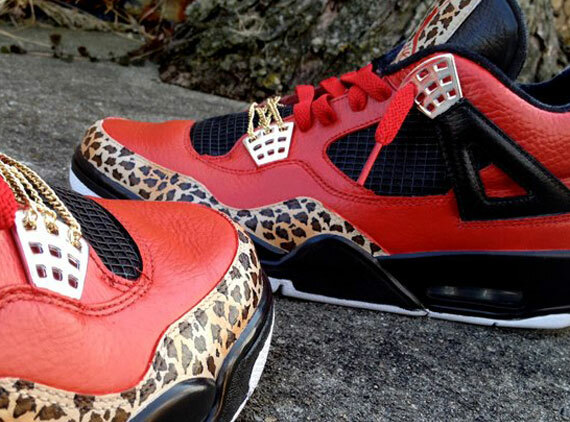 These custom Fours are a good representation of his outfit from that video, with a red base giving way to black and gold leopard accents. A gold chain near the toe finishes the motif along with matching metallic eyelets; is this fully realized Trinidad James nod strong enough to battle one of the rarest and most valuable IVs in Eminem’s ‘Encore’? Let us know after you’ve seen more photos below and stick with Sneaker News for the hottest custom designs.